Sketches done "in situ" for the month. 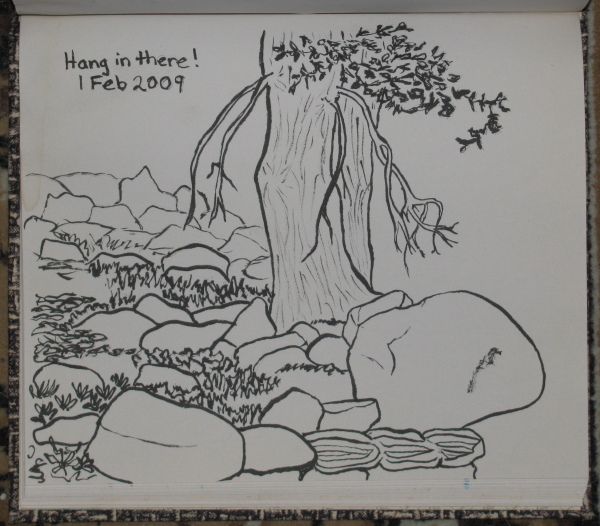 A tree on a ledge by the creek, walking upstream out of Nira. Eaton Canyon, the first of the day. 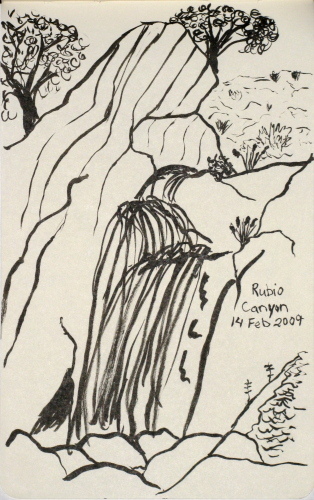 Rubio Canyon, the second of the day. 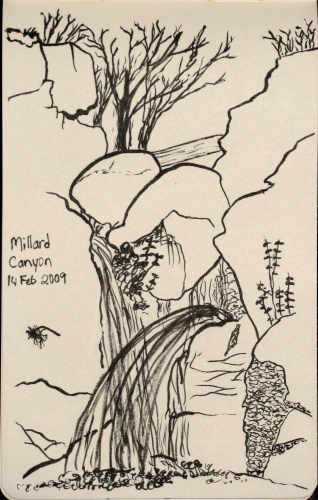 Millard Canyon, the final fall of the day. The rains had been fairly steady over the week before including the previous weekend. The weekend before that was well rained on by an earlier storm. It was high time to get out for a hike and the rains suggested going to see the waterfalls. 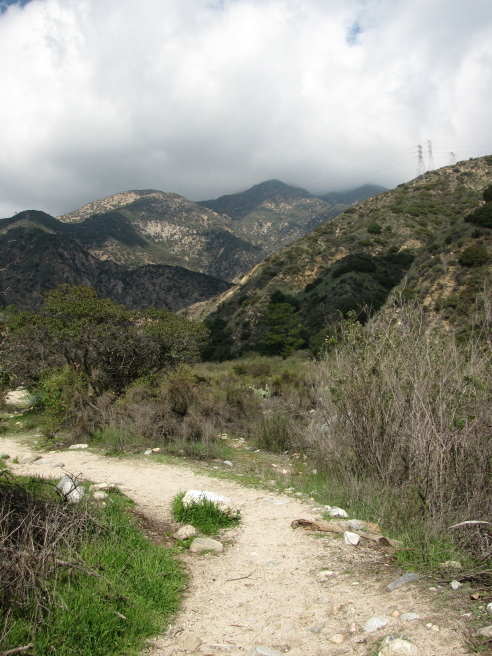 Altadena has at least three waterfalls that can be hiked to in less than a mile. 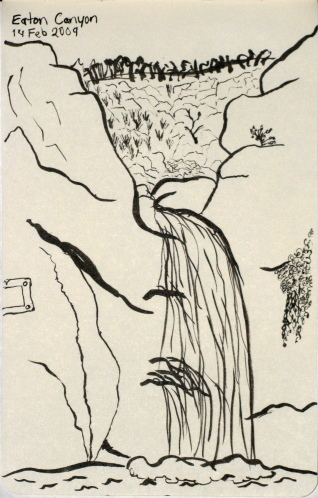 I've been to two of them, but only looked down the canyon toward the third before. I decided to try to see all three starting somewhat late in the morning. I started with the one I had not seen before because it should have the best light in the morning. Eaton Canyon has a large parking lot somewhere for everyone to park in so long as they don't want to be there before sunrise or after sunset. In two tries, I couldn't manage to make the correct turn so I went along Altadena Drive to the smaller parking area at a second entrance into the area. There were a few spots around, so no need to go for a third try at the turn for the big lot. Hiking down into the wash below, I found that this time there was actually water to cross to get to the main trail, a rather good sign. Great crowds of people were going up and down the trail on this day. Green hills in California. The trail narrows from a highway to merely a wide footpath after the toll road bridge. 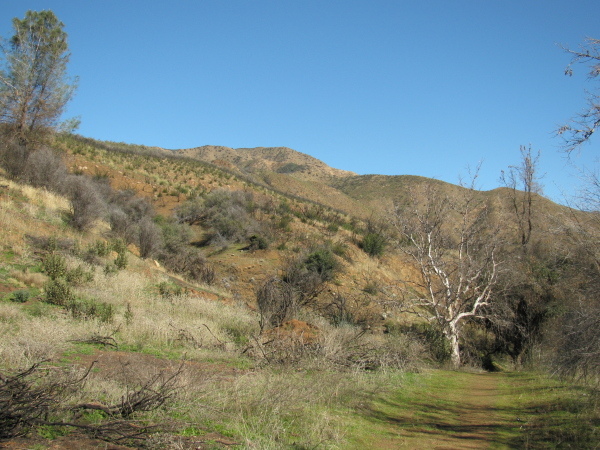 NIRA is a campground at the end of Happy Canyon road, which you can get to from highway 154 via Armour Ranch road. It is also a main entry point into the backcountry and a very common hike for us when I was young. It was also my first backpacking trip. We didn't get very far then, I think it was only about four miles in. It can be tough to go backpacking with an ill-equipped 9-year-old, you end up carrying her rather heavy slumber bag. This time, the area had been closed the previous two years due to fire damage. I was hiking again with my mom. 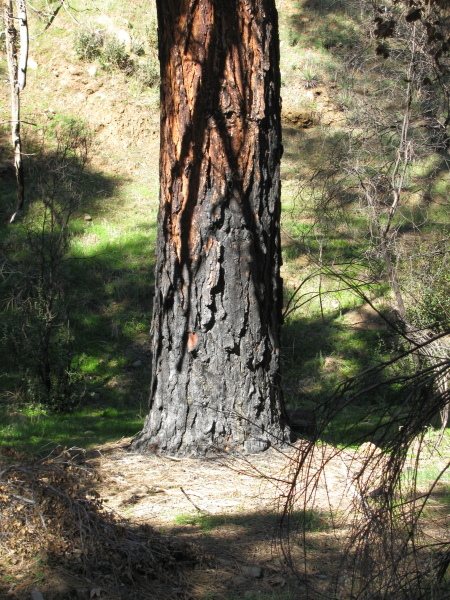 A tree tested by fire. This one is still standing tall and strong even though the base has been well blackened by the passing of the flames. The trail starts off at the far end of the campground and crosses the river. I remember it being bigger. I remember many boots off crossings. The water was usually slow and not too far up the shins. I remember many crossings with boots on, too, but I was a very enthusiastic rock hopper in my younger years. It was an easy crossing. Beyond there often wasn't much sign of fire. The immediate area seemed to be spared. Looking out over the hills, some could be seen to have a blackened tint. There was fire around here, just not everywhere. A small stretch of trail, some dead wood that would have burned well, and some hills in the background that did burn.